As we continue to wade through a sea of political uncertainty, students up and down the country are starting to ask questions about their own futures, as well as those of their friends and their teachers. At a time when the adults in their lives can’t know the answers, it can be confusing and worrying for young people. It's times like these when it is important to maintain a sense of stability by offering opportunities to talk frankly about the events as they unfold. To lend a helping hand, we have picked out a selection of top resources to support you to talk about Brexit and the UK's political system more generally. Overview of what democracies and dictatorships are; with some key leaders. Debate line activity to develop debating and critical thinking skills. Debate line signs included. End quiz - can pupils distinguish between democracies and dictatorships? Flash cards for pupils included. A lesson for post 16 government and politics students looking at the Referendum in more depth and detail. These PowerPoint and PDF resources can be used to cover the GCSE Citizenship topic Evolution of Democracy. You may also want to check out our very popular GCSE Citizenship 9-1 Lessons, Assessments, Revision Guides, Trackers and Work Booklets. 1 x KS3/4 Powerpoint, resources, differentiated tasks, starter and 1 x 30 minute reading comprehension and literacy task. Suitable for KS3/4, designed to meet Ofsted Good-Outstanding criteria, differentiated to three levels of challenge, tasks for either group or individual work. Created by a PSHE, Citizenship and RSE teacher. Find hundreds more free and inexpensive Tutor Time, Citizenship, Citizenship GCSE 9-1 RE and PSHE resources at my store. Resources to encourage pupils to speak and write descriptively, providing and justifying opinions. There is a printout for pupils with a word cloud containing relevant vocabulary. Also included are sentence openers for giving your opinion and developing your arguments. This could be used with any topics and will help to improve spontaneity. A worksheet using some of the numbers from the UK's EU referendum to work on percentages, pictograms, pie charts and bar charts. Can also be used to start discussions about whether pupils agree with the outcome based on the numbers. European Union: Brexit: What Now? 1. PowerPoint presentation about the decision of the United Kingdom to leave the European Union. It looks at what might happen to the UK economy; the United Kingdom itself and immigration, as well as the ways in which the country could leave the European Union. Five tasks to reflect on the Brexit decision. 3. PowerPoint presentation about the decision of the United Kingdom to leave the European Union. 4. PowerPoint presentation looking back at the last referendum in 1975 and comparing it with the 2016 campaign. This lesson material is designed to be used for between one and two teaching periods and includes; activities, challenging and thoughtful questions, student hand-out (for use during lesson or as a homework), embedded URL links (where appropriate), differentiated tasks and, all relevant information to help students learn about issues relating to the topic. 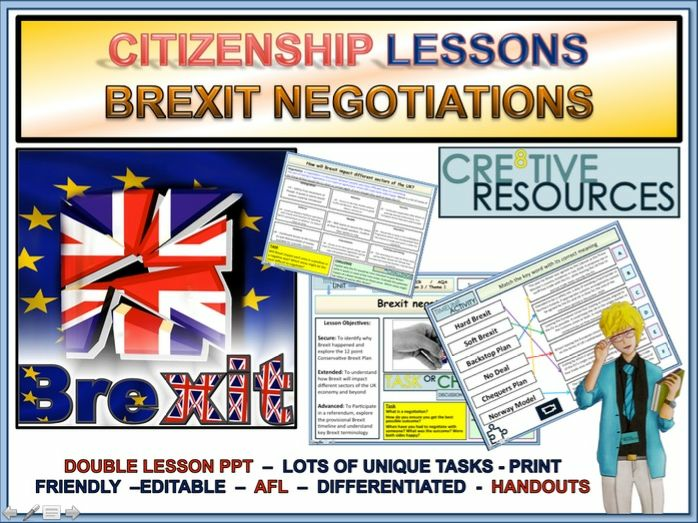 You may also want to check out our very popular Citizenship Lessons, Assessments, Revision Guides, Trackers and Work Booklets. 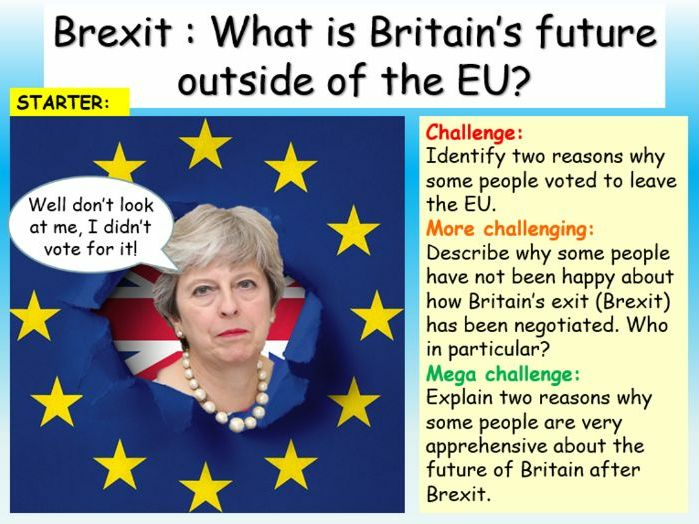 One hour, fully resourced lesson (PowerPoint, worksheets, clip tasks, activities, all differentiated three ways) all about the Britain’s future after Brexit. The lesson is adaptable, easy to follow and fully differentiated. It could be used in Citizenship, PSHCE, Politics or Tutor Time. It is suitable for KS3 or KS4. This resource pack includes an hour long PowerPoint with accompanying worksheets, templates, well differentiated activities, literacy focus tasks, clip tasks with three-way differentiated questions and information sheets. The lesson has been left editable and is filled with engaging, well differentiated and fun activities. As with all our lessons, you don’t need any prior knowledge as all the information is included - you can just pick up and teach it.